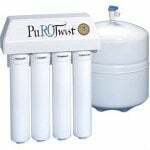 PuroTwist Reverse osmosis Filters are easy to install and replacing the filter cartridges are a breeze. Easily installed under your kitchen sink, this complete PuROTwist RO system provides clean drinking water that is safe to cook with and drink. This reverse osmosis must be used in conjunction with the included RO system faucet.